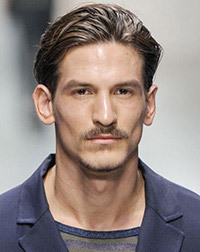 Jarrod Scott was born in Australia, on June 14, 1989, is an Australian male model. Scott was discovered while he was on holiday in the Philippines, by a model scout. He is of Italian an German descent. Jarrod's favorite hobbies are fishing, cooking and playing games on xbox. El Pais Icon Spain, GQ Portugal, CLIENT Magazine Cover, DA MAN Style Cover, GQ Spain, Details Cover, Antidote, L'Officiel Hommes Middle East, Forbes Magazine, Vogue Russia, Numero Homme, L'Optimum Cover, L'Officiel Hommes Italia, GQ Germany, GQ Japan, GQ Brasil, unFLOP Magazine Italy, Elle Men Mexico Cover, Apollo, Vogue Hommes Cover, Man of the World, Fashion For Men, August Man Malaysia Cover, V Man, DSECTION, Zoo Magazine, S Moda for El Pais Cover, Men's Health Spain, Vogue Hommes Japan, Men's Health Germany. H&M, Hugo Boss, Jean Paul Gaultier, Linda Farrow, Tom Ford, Chanel, Bjorn Borg, Emporio Armani, Jimmy Choo, Cesare Paciotti, Marina Yachting, Stefanel, Givenchy, Globus Switzerland, Roberto Cavalli. Walked runway for Calvin Klein, Jeffrey Fashion Cares, Givenchy, Ermanno Scervino, Philipp Plein, Smalto, Frankie Morello, Giorgio Armani, Bottega Veneta, Massimo Dutti, Parke & Ronen. Represented by agencies New York Ford Models, Paris New Madison, Milan Why Not Model Management, London Models 1. I'm not worried about how I look. I know I am an attractive guy. Some guys see modelling as a chance to travel and see friends and party. I see it as a business. It’s really cool to see the campaign playing in Times Square, New York. People don't have the same views as me, they just don't get it. I'm always thinking long-term. It’s lucky I workout because shooting the H&M SPORT campaign in The Hamptons was an intense all day cardio and full body weights workout. Girls always say to me, "Oh, I’m not a model, you wouldn’t be interested", and that’s really a turn-off for me because it shows you’re not confident in yourself. I want stability in my life so my plan has always been to design and build a house as soon as I could afford it, because with modelling you don't know when you're going to book your next job.